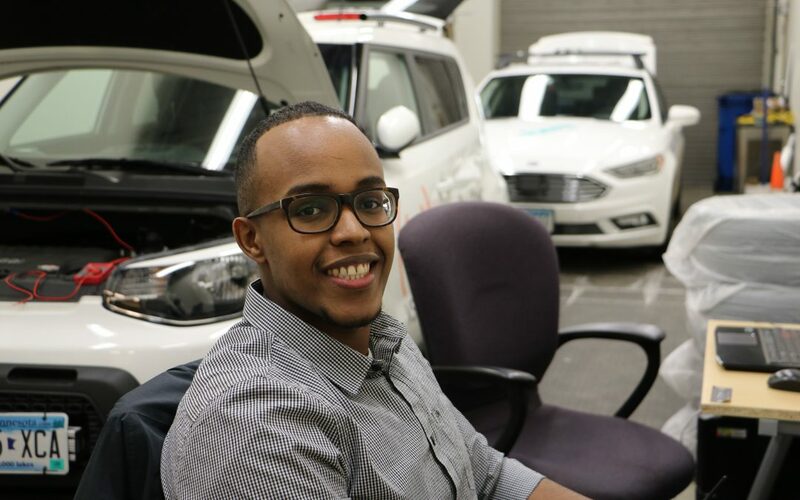 When last we spoke with Mohamed Isse Mohamud, he was wrapping up his summer internship at VSI Labs, an autonomous vehicle solutions provider based in St. Louis Park, Minnesota. At the time, he worked with fellow SciTechsperience interns, Jacob Miller and Justin Kuta, to develop LiDAR mapping and point cloud software that allowed a self-driving Kia to safely maneuver nearby neighborhood streets. After graduation, VSI Labs hired Isse Mohamud full-time. Now working as a professional Autonomous Vehicle Software Engineer, he agreed to speak with us and share his insight, reflecting on the industry, how he got there and where he is now. Tell us about yourself, Mohamed. What did you study in school? And what led you toward this field of study? Isse Mohamud: I studied Computer Science in college. I had taken a class called Internet Programming early in high school where I was taught the basics of HTML and CSS, but the class was not as in depth to programming as I’d hoped. A few years passed and I started university, unsure of what I would major in. I was eventually attracted back to programming and Computer Science during a conversation I had with my older sister in which she told me that an intro CS course, which she had taken as a one-off, had been very challenging for her. I decided to take it to see for myself and found that although it was challenging just like she’d said, it also involved a style of problem solving that I enjoyed and ended up finding very creatively fulfilling. Tell us about your internship with VSI Labs. Did you have internship experience before this, or was that your first? Isse Mohamud: VSI Labs was my first internship. I didn’t know quite what to expect going in, given that it was my first professional gig developing software. It was a completely mind blowing experience as an intern to be controlling a vehicle on the actual road with my software. I immediately knew it was the kind of thing I wanted to be doing. If you had to choose, what would you say was your biggest take away from that internship experience? What did you learn? Isse Mohamud: The biggest takeaway from my internship was seeing how much could be accomplished by a relatively tight and focused team. VSI Labs is a small company, and I learned over the course of the summer that really incredible things can be done with a small team of people and the right know-how. On the technical side, an autonomous vehicle is just as much robot as it is vehicle, and my experience at VSI Labs exposed me to the potential of robotics, and why it’s almost certainly the next big thing in technology. I learned some very practical and generalizable technical skills in a field that I think is set to play a pretty big role in the upcoming years. You recently turned your internship at VSI Labs into a full-time position. Congratulations! Tell us about that transition and how it came to be. Isse Mohamud: My approach to my internship at the start of summer was simply to learn as much as possible, and that involved throwing myself into projects like lane keeping on the highway, Adaptive Cruise Control, obstacle avoidance and more. I wasn’t aware that there would be an opportunity at the end of the summer to be taken on full time, and so I worked really hard at my projects knowing that the skills I was developing would be marketable to all kinds of companies. Nearing the end of the summer, I was asked whether I would be interested in joining VSI Labs full time, and I was really happy to accept the offer. Let’s talk about your new role. What are your current responsibilities now that you’re a full-time employee? What projects are you working on? Isse Mohamud: My responsibilities as a full time employee are working on the algorithms and applications that allow the car to drive autonomously. This involves developing control algorithms, integrating sensor technologies and occasionally helping train the neural networks necessary to recognize objects and lane lines from the sensors. I also participate in a lot of the report writing that gives our clients insight into how we’ve developed the car’s capabilities, and what technologies/tools are critical to the development of autonomous and automated vehicles. My current projects involve developing camera-based lane keeping and lane changing. I’m also working on implementing tracking and prediction algorithms necessary for successful lane changing. What is your favorite thing about working with self-driving cars? Isse Mohamud: My favorite thing is working with and developing the neural networks or artificial intelligence (AI) that allow the car to ‘see’ the world around it, everything from pedestrians and other vehicles to the lane lines on the road. There’s a reason that autonomous vehicles have only become possible in the last decade, and that is because of the rapid advances in AI that have taken place. It’s definitely one of the most important technologies enabling autonomous vehicles. If you could offer advice to fellow students and interns who are interested in pursuing a similar career, what would you tell them? Isse Mohamud: The most critical thing you can do as a student or intern looking to work in a field like autonomous vehicles, robotics or AI is to develop as an engineer both in and outside of school. A computer science/engineering major will expose you to a lot of critical coursework, but that has to be paired with personal projects, group projects and student engineering groups. Your coursework will be very general, but learning specific skills will make you stand out to a potential employer. My personal projects were part of what got me the internship at VSI Labs, and now that I’m helping interview the next cadre of interns, it’s definitely something I look out for. A student who’s showing characteristics of a lifelong learner and demonstrating that by learning from and implementing projects outside and above school is an ideal candidate, and will do well in any field. Is there anything else that we haven’t covered that you’d like to mention? Isse Mohamud: I wanted to thank the Minnesota High Tech Association (MHTA) and the SciTechsperience program for empowering small technology companies like VSI Labs to hire students like me. Quite a lot of my peers have been driven to leave the Twin Cities to be able to find work with companies that are on the cutting edge of technology. MHTA and programs like SciTech are allowing for local companies like VSI to grow and help turn Minnesota into a hub for technology, which allows tech workers like me to stay in Minnesota and still develop the skills and experience necessary to have a successful career. Get Involved: At least 350 wage matches are available through August of 2019. Learn more about the SciTechsperience Internship Program, apply online today and start your journey toward internship success.